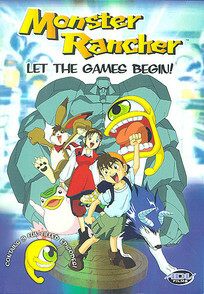 Title: Monster Rancher - Let the Games Begin! What if your favorite game became real? Get ready for the wildest adventure ever as Genki, Holly and their monster friends unlock mysterious disks, meet and make new monsters, and try to defeat the evil Moo! When Genki wins a special CD-ROM that magically transports him to the world of Monster Rancher, it's real-life fun and games! There, he saves Holly and her eyeball monster Suezo from the evil Black Dino Squad! Then Genki makes his very own monster the baby Mocchi. Later, they meet the gentle stone giant Golem. Will Golem be enough to stop the Moo's evil blue Gel Troops? You better hope so, because saving the monsters of Monster Rancher is a game Genki just has to win!